Here’s a one off comp, with 7 stories, 5 – real people and 2 – real objects. I hope you enjoy. In 1906, Clara Germana Cele was an ordinary, sixteen-year-old from Natal, South Africa before she began displaying some very strange and frightening behavior. She was recorded as being able to understand various languages, despite the fact that she had never been exposed to those languages. Even more strangely, Clara could somehow reveal intimate secrets of people whom she had never had contact with and display unusual strength by hurling people about. The use of holy water would briefly return her to her original state although it would not last long. Whilst at the Christian school, she would often float 5 ft the air unassisted with over 100 people witnesses. When the girl’s confessor, Father Hörner Erasmus, was called in, he revealed that Clara had earlier confessed to him that she had made a pact with Satan, thus giving the demon a chance to take over her body. Later, though, Erasmus and another priest reportedly drove out Satan from her body in a rite that lasted two days, despite the alleged demon’s attempt to fight against them. Julia, the only person who was confirmed possessed by a professional. New York Medical College associate professor; Dr. Richard E. Gallagher confirmed this. Julia had a long history with involving herself with satanic groups and performing rituals. The only problem was that she eventually began to experience strange occurrences with her mind and around her. Dr. Richard E. Gallagher was then contacted to visit and provide an analysis to see if she was mentally ill and also a priest. The exorcism began on a warm day in June when the “Despite the weather, the room where the rite was being conducted grew distinctly cold. Later, however, as the entity in Julia began to spout words in various languages, (mainly Spanish and latin) and make strange beastly noises. Members of the team felt themselves profusely sweating due to a stifling emanation of heat. The participants all said they found the heat unbearable. Julia was freed from her demons but Dr Gallagher has never forgotten such events. Roland Doe (A false name to prevent real identity) was the only child and was especially close to an aunt who was a spiritualist. His Aunt soon began to introduce him to an Ouija board and showed him how to use it. Board and, wouldn’t you know it, strange happenings began. It wasn’t long before a Roman Catholic priest was contacted to exorcise the demon. During the Exorcism the boy tore into his bed, pulled a spring from his mattress and slashed the priest. The cut required stitches and the exorcism was put on hold. Another Priest was introduced -Rev. William S. Bowdern to continue the exorcism. Over a period of two months, Bowdern performed the exorcism thirty times with Walter Halloran assisting and acting as witness. Roland spat in the eyes of his rescuers, spoke in a deep, unnatural voice and broke Halloran’s nose. His bed shook violently. The words evil and hell appeared on his body. In the end the demonic forces subsided and he continued a normal life working for the government. 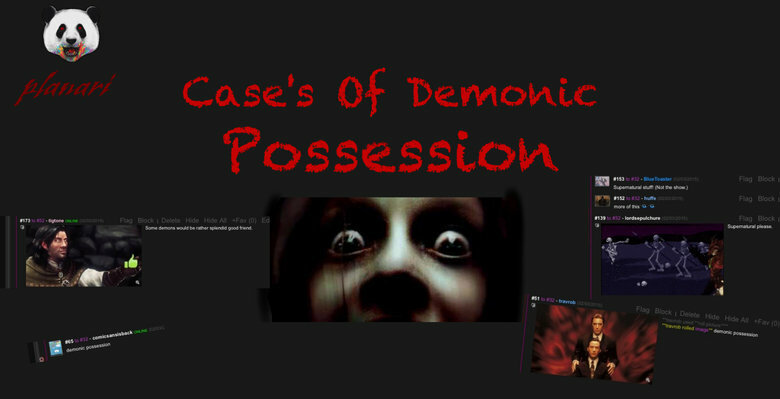 The 2005 horror flick The Exorcism of Emily Rose is scary enough, but the fact that it was based on a real life possession makes it ever so much disturbing. – Devilish hallucinations while praying, claiming to see the faces of devils. – She also began to hear voices, which told her that she was damned. – She began injuring herself, eating insects, and drinking her own urine. Anneliese endured 67 rites of exorcism over a period of 10 months. With no luck. She died later in her home due to dehydration and malnutrition on July 1, 1976. The priests who conducted the attempted exorcism, Fr. Arnold Renz and Fr. Ernst Alt, were tried and found guilty of manslaughter. They were sentenced to six months imprisonment and three years probation. Pat Reading had no history of mental illness nor any type of interest of the paranormal. For this reason, it was especially unsettling when she began hearing strange banging noises in her home, which shortly progressed to the overturning of furniture and violent attacks on her. John Zaffis a Paranormal investigator made a visit and reported that bite marks would unexplainably appear on her back and some of her hair was torn from her scalp. A catholic priest was called in to perform an exorcism and 16 were attempted with no success, Reading later died from colon cancer immediately after yet she continued to suffer from the attacks even after. Do you have a favorite chair in your home? Consider cursing it after you die so no one else can sit on it without dying. That’s what Thomas Busby did in 1702, right before he was executed for strangling his father-in-law to death for — you got it — sitting in his chair. Supposedly 63 people who have sat on the chair met untimely deaths, sometimes mere hours after plopping their keister on Busby’s beloved chair. In 1972, the Thirsk Museum actually had to suspend it from the ceiling to prevent people from committing suicide by chair. Here’s the facts: Italian artist Giovanni Bragolin painted a picture of a crying boy that inexplicably became very popular in the 1950s and had many prints made. In 1985, the always reliable British newspaper The Sun reported that a fireman claimed to have found these prints in multiple houses destroyed by fire… although the prints were perfectly fine. Apparently, British firefighters were already so freaked out by this phenomena none of them would allow copies of the painting into their own homes. More such incidents of the prints being unscathed in house fires, both before and after the article, were reported, and suddenly a story popped up that the painting was of an orphan whose home had burned down. What I want to know if why so many people wanted to hang a picture of a sobbing kid on their walls in the first place.